If you are a regular reader of my blog, then you know by now that while I love super simple treats, I also have a major love of an over the top dessert! In fact, this dichotomy is indicative of my own personality as well. Most of the time, I’m a pretty laid back kinda gal. Jeans and a top, hopefully cute, but not trying too hard. I mean really, I just don’t have time for that. I used to. But not these days. And ultimately, I want to be comfy. Not comfy = me in a bad mood. However, when I’m feeling particularly fabulous or I’m going somewhere that maybe I can get dressed up, I really do love to dress up. Sometimes I wish was like Kate Middleton or something (you know, a princess) and always got to be super cute and have places to dress up for. This cake really isn’t hard to make, despite being dressy. Yes, you have to bake the brownies, but after that it’s smooth sailing. I used my new favorite brownie recipe rather than using a box mix. Not only do I totally love this brownie, but a single box mix wouldn’t be quite enough for 3 layers. So if you decide you’d rather go the box mix route, you might want to do 2 mixes. Once the brownies are made, it’s all about the cookie dough. It’s eggless, so totally safe to each without baking. No worries there. The method of layering everything together and getting nice, even edges is very similar to the method I use in my Snickers Peanut Butter Brownie Ice Cream Cake. Basically, you layer everything in a cake pan and then lift it out using parchment paper or saran wrap. It might sound confusing, but it’s explained in the directions and is easy peasy and works like a charm. Of course I thought about just letting this cake go all natural on me. I still think it’d be super cute with rough cookie dough edges. Maybe just use a cookie scoop to add the cookie dough and then stack with the brownies? It’d be beautiful and elegant in it’s own way. I sure hope you have an occasion coming up, because this cake would be perfect! UPDATED 9/7/16: See the cake getting put together in this new video! 1. Line the bottoms of three 8 inch cake pans with parchment paper and grease the sides. Preheat oven to 350 degree. 2. Mix together the oil, sugar and vanilla extract. 3. Add eggs and mix until well combined. 4. Combine flour, cocoa, baking powder and salt. 5. Slowly add to the egg mixture until well combined. 6. Pour the batter evenly into the three pans and spread evenly. 7. Bake for 25-30 minutes, or until a toothpick comes out with a few crumbs. 8. Remove brownies from oven and allow to cool for about 10 minutes in the pan, then remove to cool on wire rack. 9. While brownies cool, make cookie dough. 1. Cream butter and sugars together until light and fluffy, about 3-4 minutes. 7. Mix in peanut butter and vanilla extract. 8. With the mixer on low speed, add flour. 9. Add milk to preferred thickness. 10. Stir in chocolate chips. Dough will be thick. Set aside. Once the brownies are cool, it’s time to put the layers together. You can pile the cookie dough onto the brownies, stack the layers and leave messy layers, or use the method I used for having clean edges/sides of the cake. 1. Place half of chocolate chips in a metal bowl. 2. Microwave half of the heavy cream until it starts to boil. Remove from microwave and pour over chocolate chips. 3. Cover bowl with saran wrap for 5-7 minutes. 4. Whisk chocolate and cream until smooth. 5. Using one of the same 8 inch cake pans that you baked the brownies in, put parchment paper or saran wrap in the bottom and up the sides of the pan. You will use it to lift the layers out of the pan. 6. Place the first brownie into the bottom of the pan. 7. Add about 3 tbsp of chocolate ganache on top of the brownie and spread into a thin layer. This will help the cookie dough stick to the brownie. 8. Put half of the cookie into the pan and spread evenly on top of the brownie. 9. Remove the first two layers from the cake pan and place on it’s serving dish. 10. Repeat steps 5-8 with the second brownie and remaining cookie dough. Then remove from pan. 11. Put another 3 tbsp of chocolate ganache on top of the cookie dough layer from the first section of cake and spread thinly. 12. Place the second section of cake onto the first. 13. Put another 3 tbsp of chocolate ganache on top of the cookie dough layer on top (the fourth layer) and spread thinly. 14. Top with remaining brownie. 1. Place remaining chocolate chips in a metal bowl. 2. Microwave remaining heavy cream until it starts to boil. Remove from microwave and pour over chocolate chips. 5. Allow to sit for a few minutes until it just starts to thicken, then pour over the top of the cake. 6. 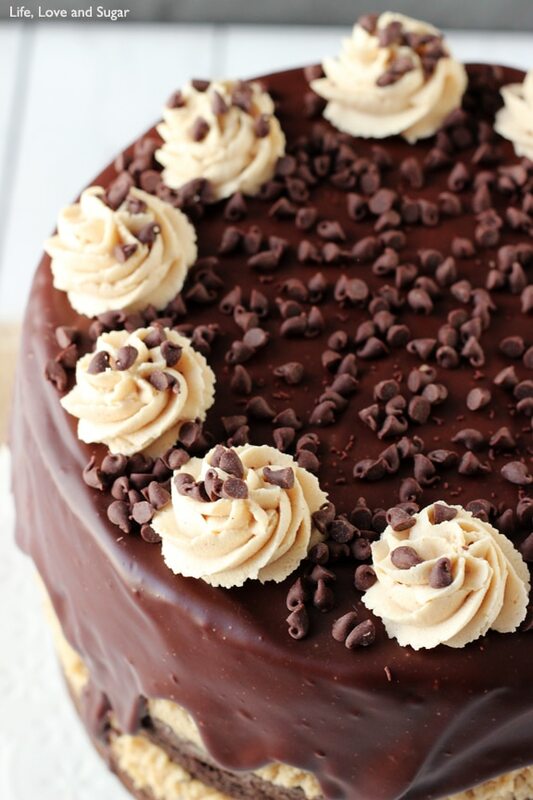 Place cake in refrigerator and make the peanut butter icing. 7. To make the icing, beat the shortening and butter together until smooth. 8. Add the peanut butter and mix until smooth. 9. Slowly add the powdered sugar and mix until smooth. 10. Add water or milk. 11. Remove cake from fridge, and pipe icing onto the top edge of the cake and sprinkle with mini chocolate chips, if desired. Just found this recipe. But am wondering about the amounts of ingredients for the brownie layer – it lists only 1 tablespoon of cocoa…is this correct? Would love to make it but want to be sure I have the right amounts. Thanks!!! Sorry about that Genna! It should have been 1 cup. Thanks for pointing it out! It’s been updated. 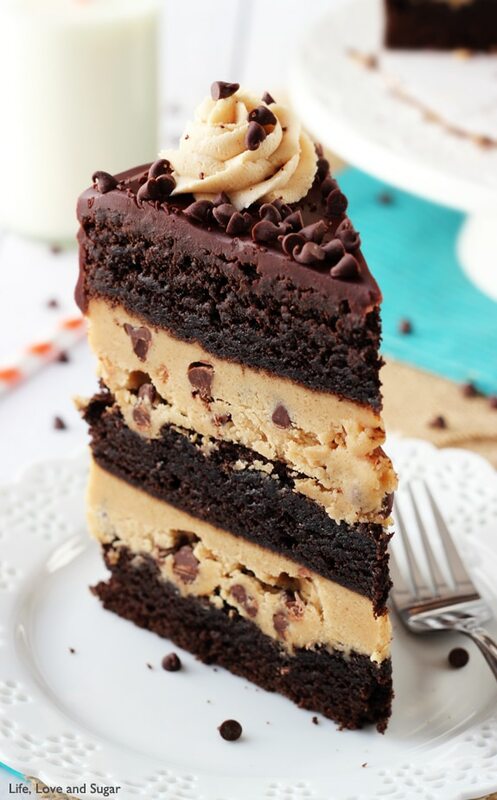 Oh my goodness, I don’t think it can get any better than the peanut butter cookie dough brownie layer cake!!! YUM!!!! Holy mother is cakes, this is insane. You’ve out done yourself! This cake is just so freakin’ awesome Lindsay! 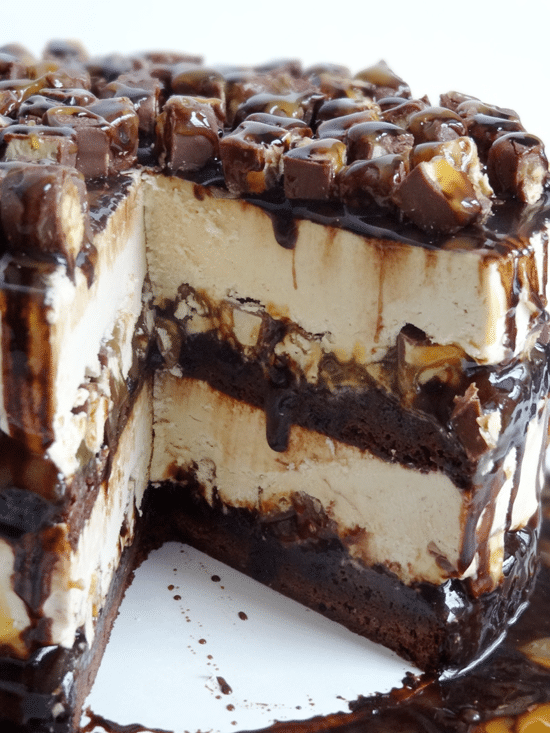 All those layers of decadence…drooling! Pinned! Are you KIDDING ME?!?! This cake is insane. 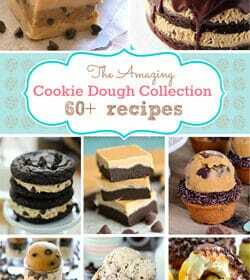 I kept scrolling and the layers of cookie dough and brownie and chocolate kept appearing! I almost passed out. Pinned. And bookmarked. And I can hardly wait to make it! Haha, thanks Lindsey! I hope you like it! Oh. MY. Goodness! I am doing a happy dance right now… and I can’t stop! Pinning and sharing! I NEED a slice of this cake! Absolutely incredible, Lindsay! I couldn’t Pin fast enough – this cake looks absolutely out of this world! This cake is STUNNING! Pinned! Holy amazing cake batman!!! I love all the layers and high and pretty it is! Absolutely stunning girl!!! Wow. This is just…. wow! All my favourite things, all in one big tower of heaven. 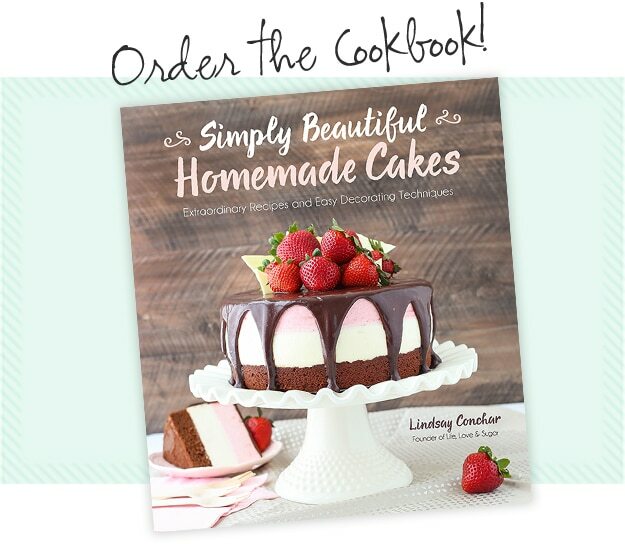 I’m not sure I can wait for a special occasion to make this! I love your dressy side! Wow! I personally rarely dress up, it makes me uncomfortable. However, every once in a while I really want to get all dolled up and look really girly! That’s not likely to happen, this cake however IS likely to happen! Man that ganache is awesome! Haha, thanks Tanya! I agree, comfort is key! Oh My Goodness! Are you kidding me?? Why oh why did I come here *says the one who’s been on Weight Watcher’s for 4 months*?? Thanks Dorothy! OMG, WHBM is such a trap – I love their stuff! Can this cake be frozen and thawed out? I worry the brownie will dry out. It looks amazing! I did freeze a few pieces for my mom and it didn’t seem to dry out. It was only frozen for about a week though. I’m floored! This looks absolutely amazing. Really. I love how tall it is from the layered deliciousness. Brownies?! and cookie dough too!!! I LOVE this! Pinning. Sharing. Drooling. Thank you Jelli! Thanks for sharing! Holy cow that looks good. 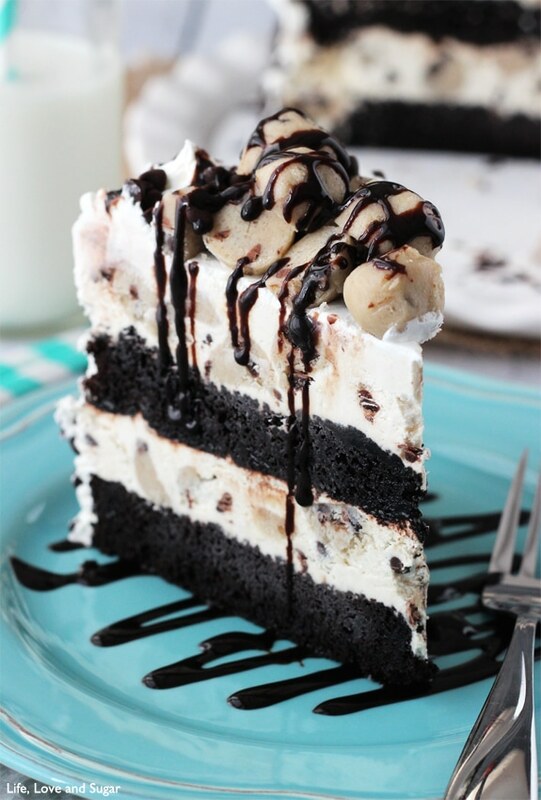 A lot like my cookie dough Oreo cake but extra extreme with extra layers and that oozing over topping. Going to make this cake for my boyfriend’s birthday next week! It’s the prefect cake for him! However, I was wondering about using chocolate cake instead of brownie layers… Do you think that could work? The cake looks delicious. But I’m still concerned about the cookie dough, because it’s uncooked. Are you sure that amount of flour (2 1/2cups) could be eaten raw? 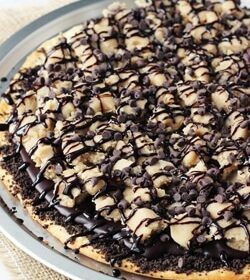 This looks terribly sinful and YUMMY!!!! 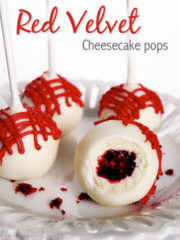 This looks amazing, and I am planning on making it this weekend for a birthday party. If I am making this cake the day before the party do I need to refrigerate overnight or can it be left at room temp? It’s up to you really. The cookie dough has butter in it, so I’d probably recommend refrigeration. However, I would take it out of the fridge for at least 30 minutes before serving. Oooohh! This looks so decadent! My problem will be not eating all the cookie dough before I make the cake! Thanks my problems with most things – cookie dough, cake batter, icing. 🙂 Thanks Susan! This is insane!! SO beautiful and decadent looking. OMG!!! This looks amazing! I’m so glad I saw this on Two Cup Tuesday. Pinned it, and drooling over it. Oh WOW!! 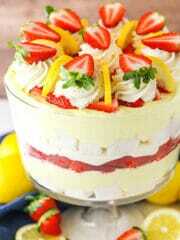 This cake looks heavenly!!! This looks so yummy! My husband’s birthday is coming up, but we live farther away and plan to wait to do the “birthday” things with our family. I wanted to make this for him on his birthday, but it’s just so big that we would either throw away half of it or gain ten pounds trying not to. Would there be a way to miniaturize this? Like making the layers in ramekins instead? Thanks! A fun way to make it mini and transportable would be to do it in jars, like mason jars. Kind of like little truffles. The same flavor, just different packaging. You could bake the brownies and make the cookie dough, but then cut the brownies into smaller squares, kind of like crumbles and do layers of that and crumbled cookie dough. Then pour a little chocolate ganache over top of each one. The ramekins is a good idea too, it’s just harder for me to tell you how to go about it since I haven’t done it. Love this recipe. I made this dessert, the non dressed up version, just piled on the cookie dough without smooth edges 🙂 Still tasted delicious. What would you substitute in the cookie dough if you wanted a plain cookie dough, not peanut butter? Would you just leave the peanut butter out? would you add more butter?? I’m so glad you love it! 🙂 If you want it without peanut butter, you can just leave the peanut butter out. If you find you need more moisture, just add a little more milk. Thank you, this was my question exactly! This cake looks too good to be true! 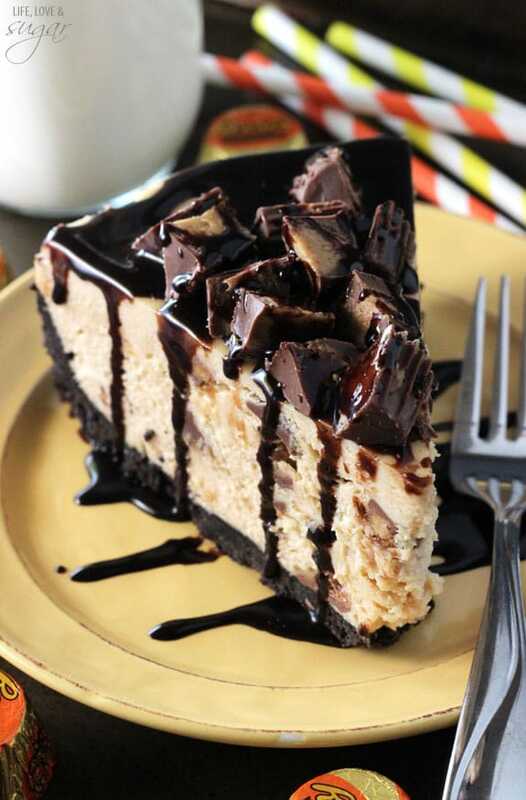 My favorite desserts always combine peanut butter and chocolate. This looks amazing! Can I do this cake in a cup-cake version or push pops for a bake sale? Any tips on that? I’m sorry it’s taken so long for me to respond Elizabeth! We’ve been out of town. I definitely think you could do push pops quite easily. Just bake the brownies and make the cookie dough and then break the brownie into pieces to make the brownie layers and do the same with the cookie dough for those layers. It’d be delicious! 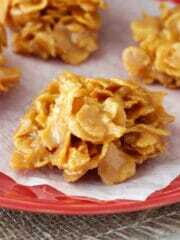 I’m planning to make this but have a question; do you refrigerate it again after taking it out?? Where did the recipe go? I thought it was listed in the blog post, but I cannot see it on my computer or my phone? You should be able to see it now. I’m sorry about that, not sure what happened, but it’s fixed. 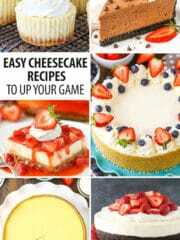 Where can I find the actual recipe? I really wanted to make this for my husband’s birthday because it looks sooo delicious! However, the brownies turned out terrible. It obviously may have been something I did but I’m pretty sure I made them right–according to the directions. They didn’t bake well, didn’t hold up at all either, and tasted really weird. My suggestion for those who want to make this is to use a favorite brownie recipe or just chocolate cake. Thanks for the recipe–hopefully it will turn out better for me next time! I’m sorry you had a bad experience with the brownies. I’ve made them a number of times and never had trouble. Definitely a box mix would work as well, but you’ll probably need two boxes to get the 3 layers. I too wanted to bake this cake for my SO’s birthday because it looks amazing! But unfortunately, just as Carmen, the brownies turned out terrible: they didn’t bake properly, didn’t taste good (they tasted mainly like egg with sugar) and were falling apart. I had to throw it away and start again with a brownie recipe I know… I wasn’t sure if I would continue with this recipe or go for something else entirely but finaly chose to stick with it. I hope the end result will be ok! OMG, I don’t know what happened, but something went terribly wrong????. I followed the recipe exactly, but the brownies cooked and overflowed in the oven. Now our house is smoked out:-(. I am so sad because the brownie batter tasted great. I can only assume the pans were too shallow, so I may have to cut the recipe a bit to account for my pan size. So sad because the cake looks amazing???????? Thank you for this ultimately deliscious invention. I did this cake fur my husbands birthday and I cannot stop eating it!!!! (I’m 7 months prego by the way!!!) And you got me addicted to cookie dough!!! I followed your recipe to the letter and it turned out really deliscious. The recipe is very detailed but easy to follow well done!! Will definately try it again for my birthday!!! I’m so glad you liked it! 🙂 Congratulations on the baby! Mmmm this looks sooooo good! Hi! Firstly, this cake is absolutely GORGEOUS! All my favorite things in one dessert; just fab 😉 I had a quick question; I made this cake last night for a dinner I am having tonight, and I did a quick taste test of the cookie dough. Is it supposed to have a rather gritty texture? My brown sugar was soft and moist, and my white sugar didnt have any lumps. Let me know if this is normal; hopefully the whole dessert together tastes just fine! I know cookie dough does tend to be a little gritty, but this just seemed too much. Thanks for the great recipe! Hi Zara! I hope it ended up tasting great! It shouldn’t really be gritty. It’s basically the same cookie dough I use for cookies, minus the eggs and leaveners. It could be that it need to sit a bit and all kind of come together. Did it work out all right? This is a great idea, but way too sweet! Maybe we are just used to darker brownies and less sweet cookies, but unfortunately, it was almost inedible. I felt really bad because I asked for it for my birthday, and my mom spent a lot of time making it, and now we have all this cake that no one wants. I think doing similar, but with your own favorite brownie and chocolate chip cookie dough recipes might be a good hint. Or just use less sugar and more chocolate maybe? We, unfortunately, have a peanut allergy issue in our family. 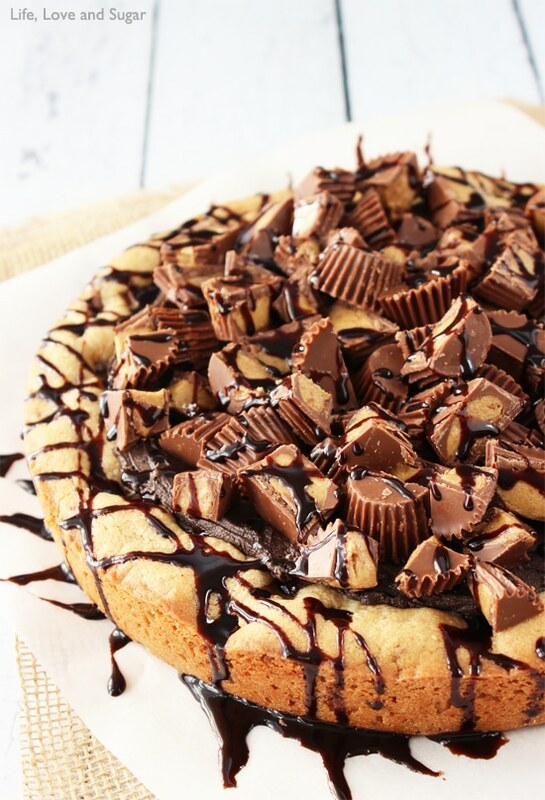 Would the elimination of peanut butter in the cookie dough still leave a good flavor? 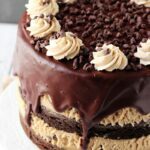 Can I eliminate the peanut butter from the icing or need to make a different type icing for the cake? Yes, it will still be great without the peanut butter. Just replace the peanut butter with butter in the cookie dough. For the icing, add 1/2 tsp vanilla extract to have a vanilla icing, or about 1/4 cup of cocoa for a chocolate icing. I finally found a recipe I would like to make thank you..
what the prep time for this cake? what is the Cook time for this cake? what is the ready in time for this cake? I didn’t keep track of times when making it, so I can’t say for sure. The cookie dough isn’t baked, so the cook time is the time for the brownies. All time included is a fair amount – at leave a few hours – given the baking of the brownies, allowing them to cool, making the cookie dough and stacking it all. If you serve it immediately, that reduces some time, but I do refrigerate it first usually. This recipe looks amazing! I want to make it for my son’s birthday party this weekend. Do you think I can make it ahead of time, or is it a “same day” kind of cake? Thanks! Thank you! Yes, you can definitely make it a day or two ahead. I made this yesterday for my cousins Birthday. Everyone will be talking about this cake forever! It was epic and really not that hard for a novice like me. Thanks so much!!! I’m so glad everyone enjoyed it! Thanks Catherine! Hi! I want to make this for my christmas party and I was wondering how to you put the cookie dough on top of the brownies like you did? I didn’t exactly catch that n the directions? I’m just afraid if I do it my way the brownie will fall apart? Thanks! You can scoop it onto the brownie and then press it down or smooth it with a spatula. It’s pretty thick. Is the brownie batter supposed to be grainy from the sugar? If I remember correctly, it might’ve been a little grainy at first, but smoothed out as it sat. 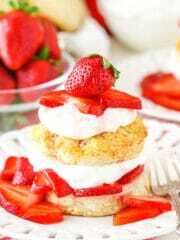 This cake is SO delicious! I’ve made it a few times over the last couple months and everyone loves it! I made 2 yesterday. One for a Bday party and one for a Christmas party. I topped them with Reese’s Peanut butter cups since I didn’t have the ingredients for the icing. Big hit! Thank you so much! I’m so glad you enjoyed it! can i caver this cake with sugarpaste? it seems great! Gosh, I’m not sure. It’s not a very smooth cake, so it might be kind of lumpy. You’ve combined the two things that I ADORE!!!! 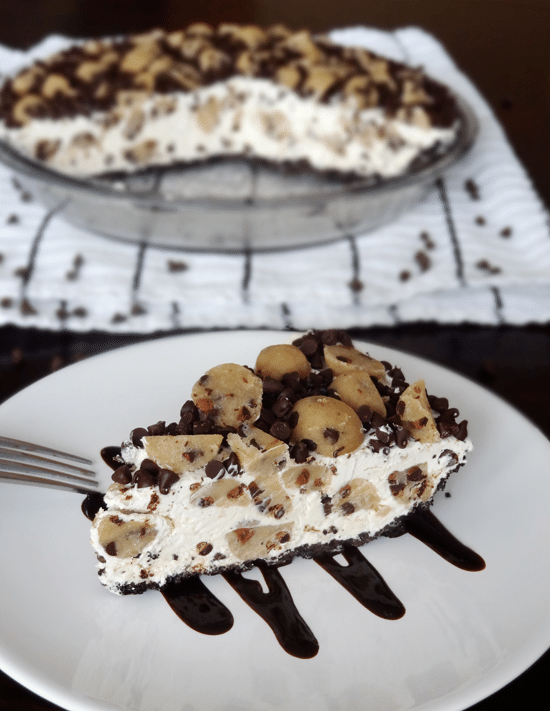 Definitely making this later today. I’ve been craving something sweet and I’m not the BIGGEST fan of just regular cake so this is so so so perfect. def want to try this recipe! You could make the brownies ahead of time and have the cookie dough ready in the fridge. You’ll need to let the dough thaw before you’d be able to press it into the cake. I’d let the whole cake sit out for about 20 minutes to soften a bit before cutting. I was thinking about making this for a cake auction fundraiser for my daughter’s elementary school. The thing is, we have to drop the cakes off in the morning and they sit out all day until the evening auction (probably 14 hours). Do you think it would hold up? Worried about the cookie dough getting soft and the whole thing sliding apart. Hmm, the whole thing is pretty dense. I’d like to say that it’d be fine, but I don’t know for sure. It kind of depends on the size of the slices. It’s a pretty rich, tall cake. I’d say it’d make at least 12-16 good sized slices. Hello! So I made this over the weekend to see if I could do it and have it look as good as yours for a baby shower next weekend. My husband apparently isn’t aware that an 8 in pie pan and an 8 in cake pan are different 🙂 So the trial cake isn’t quite as pretty as yours above. But it certainly is tasty. My only regret here is that I didn’t put half of the dough on the first layer (see what happens when you get excited and don’t read all the instructions?) So it isn’t quite even looking. But it is delicious! I will be trying this again with the proper pans and the proper amount of dough on both layers!! Thank you for this! And for those who say the brownie is too sweet – It is kinda sweet but its a brownie! Who wants an unsweet brownie? Anyways thanks again! P.S. The cookie dough makes a yummy snack for cheat day! Can the brownies be made a couple of days prior?? or are the best baked on the day? i love this recipe! I can’t wait to have a reason to make it. I have one question though, can you substitute Something for the shortening in the icing (maybe double the butter?) ? Yes, you can replace the shortening with butter. Enjoy it! I love this recipe and can’t wait to make it! One question though, can you double the butter instead of using shortening in the icing? Or another substitute? Thanks! 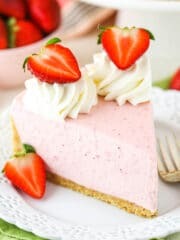 This looks so good and I want to make it this weekend for Father’s Day I just wanted to know, how far in advance can I make the brownie layer? if I put it in Saran Wrap in the fridge would 3-4 days be ok? The brownies can be made a day or two in advance, but I wouldn’t refrigerate them until you actually put the whole cake together. Just keep them in an airtight container. Once you refrigerate brownies (or cake) they start to dry out. Room temperature is better. Can I bake the Triple Chocolate Cake in two 9″ rounds instead of three 8″ rounds? Yes, you can. I don’t remember the exact baking time, but it’ll need to bake a little longer. I just made this cake today for my daughter’s birthday. I was amazed that it was easier than I thought it would be. I used two boxes of Ghirardelli brownie mix in lieu of the recipe here because of time constraints and it worked well. Everybody loved it!! Made this for Christmas dessert. It was good, but I have to say it’s been MUCH tastier after setting in the fridge. 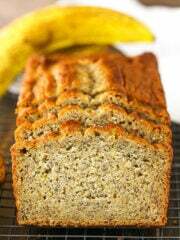 I had a second piece the next day and the taste and consistency had improved after an overnight in the fridge. Maybe layers needed a chance to come together a bit? I would definitely make again! I was on your blog about Joan and looking over your recipe for the turtle chocolate cake. 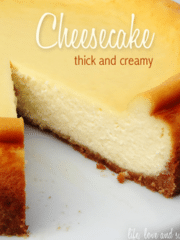 It looks wonderful and I am going to attempt a gluten free version this weekend…hopefully. Near the bottom of the page there we several photos of cakes….one was this one here, but when I tapped on the link it sent me to a website called itWFT. Not sure what that was about…but thought I’d share with you. Thanks for this yummy turtle recipe….anything turtle(ish) is wonderfully yummy! Oh no, that’s weird! I’ll definitely look it that! Thank you! I hope you enjoy the cake! Made this for a Super Bowl party. Worked out great! I would omit the peanut butter from the cookie dough next time since I didn’t care for the flavor. It’s a heavy ‘cake’ so just keep that in mind. But it came out wonderfully. I also didn’t do the PB frosting and instead opted for my dads chocolate frosting. I have made this a number of times, and it’s a hit with everyone. One issue I have had is with the weight of the cake pushing out the cookie dough layers. I’m going to try chilling the layers during the building process – if I have time. Thanks for posting this. I can’t wait to try a few of the other cakes you have posted here! I don’t have a blondie recipe on the site. I suggest finding one you like to swap out with the brownies. 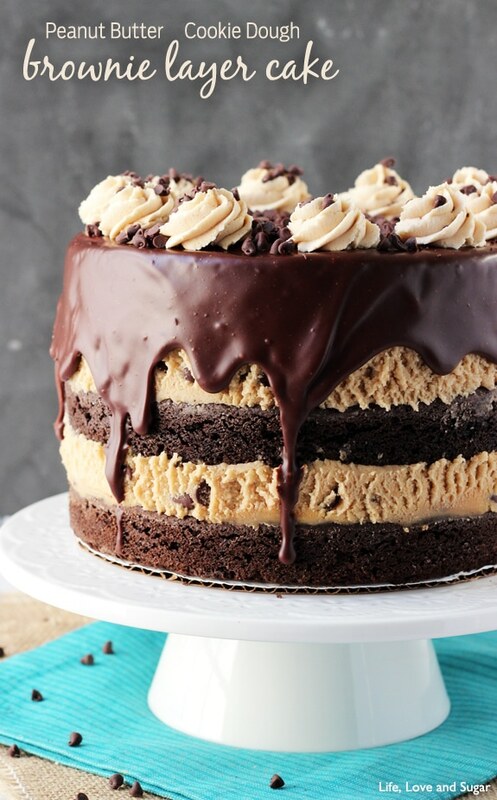 Would you be able to use the frosting in between the layers as well? 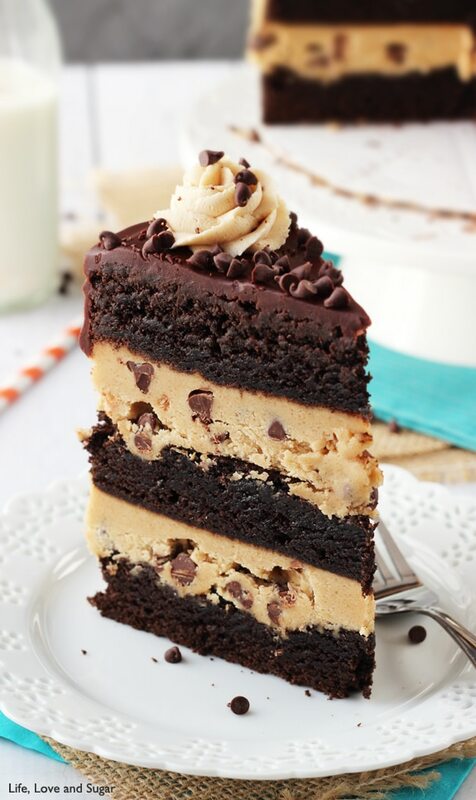 Hello, this cake looks soooo nice, but I have a few questions, if you don’t mind.. First, you don’t bake the cookie dough, but one of the ingredients is flour. It’s fine to use flour and eat it without bake? Second, how tall is the cake? I will make a square cake instead of doing it round for about 20 people and I was wondering if the amount of ingredients is enough. Thank you so much!! I don’t usually have issues with the flour, but use your best judgement. I’ve heard of people toasting flour before, so you could consider doing that. With 5 layers, it’s pretty tall. I don’t remember the exact hight, but probably close to 5 inches. 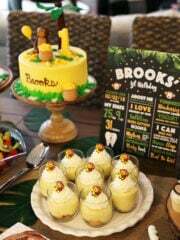 My Grandson found this recipe for his birthday cake ans asked if I would make it for him well let me tell you the smile on his face was priceless and not to say how good it was. Thank you so very much for makung his day and Grandmom was the bomb in his eyes. Keep up the good work. 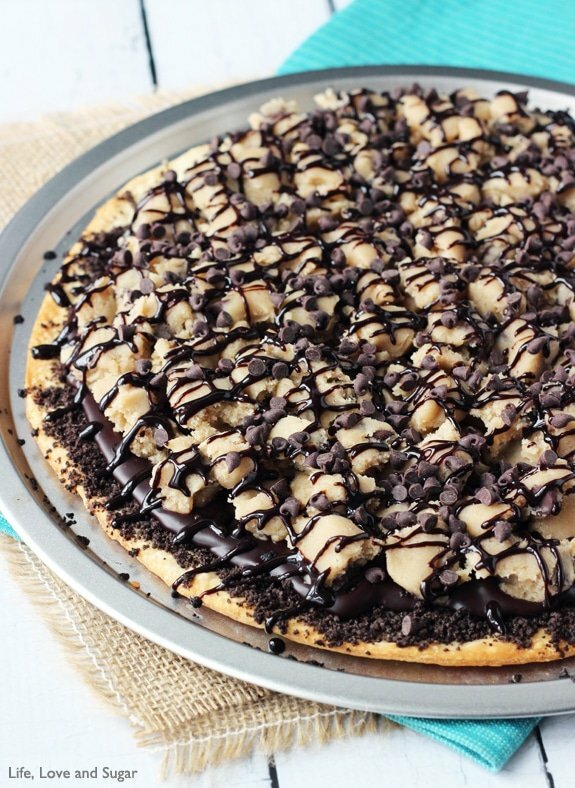 If I wanted to make this with regular cookie dough (instead of the peanut butter) would I just leave the peanut butter out? Yes, it should be fine to leave the peanut butter out. If the dough ends up a bit thicker, just add a little more milk. I came across ur website. 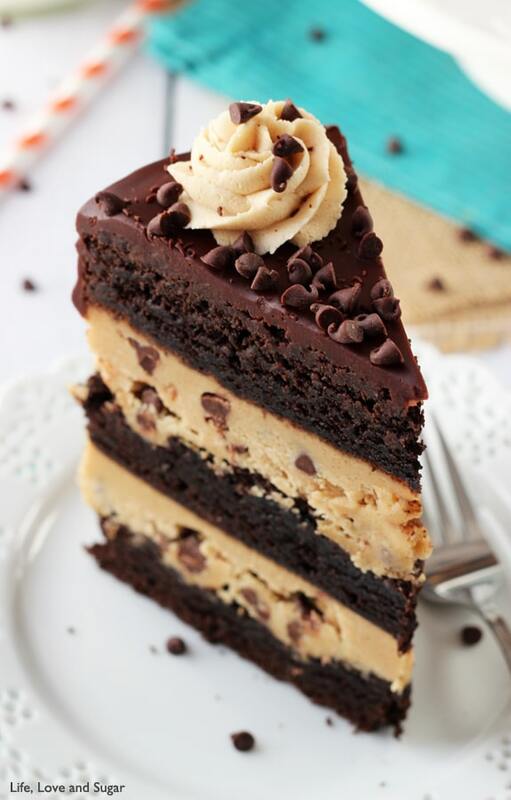 Loved to try the cookie – dough brownie cake. for my two month baby girl monthly, birthday celebration. I have a question. The cookie dough ingredients, you have mentioned to put flour. But not to bake or cook it. Can we use as it is, I mean doesn’t it sound to eat raw. I usually don’t have issue with raw flour, but if it’s a concern for you, you can toast the flour prior to adding to the dough. Quick question. What do you do with the other 1/2 cup of heavy cream in the ganache? It says to microwave half of it and pour it over the chocolate chips, but it doesn’t say what to do with the other half cup. Help please! 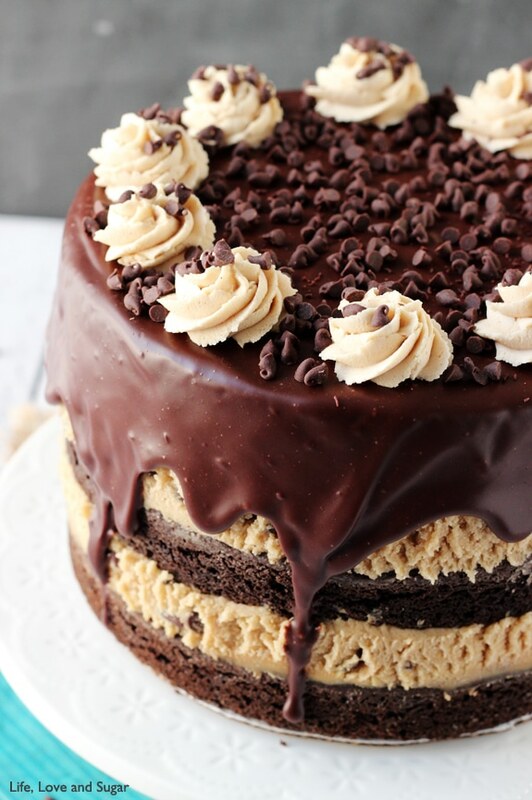 Half of the chocolate chips and heavy cream are used for the ganache between the layers, the other half are used in the ganache for over the top of the cake. I have made this cake and the taste of the chocolate and peanut butter was wonderful. I have one question about the cookie dough layer. In my dough you can taste a lot of crispy bits of the brown sugar, is that how it’s supposed to be or can I make the dough smooth without those crispy bits? My dough also wasn’t as thick as yours. My guess is that the brown sugar you used had little bits in it. That can happen – I try to pick the biggest ones out. If the dough ended up a little thin, just don’t add as much of the milk next time. Raw flour should NEVER be consumed as it can harbor e. coli and salmonella. You’re going to make your readers sick. I think it should be fine. You might need to add some milk or something to replace the lost moisture though. Just add enough so that the dough comes together. Any advice for converting to a rectangular pan? I know you get more servings from square/rectangle pans than rounds, and I’ve got 12 adults plus kids coming over. I imagine it would convert just fine, just not as pretty per slice. Also thought to leave it round and just make a vanilla cake for the kids. What are your thoughts? You should get 12 slices out of this cake, as is, easily. It’s very rich. 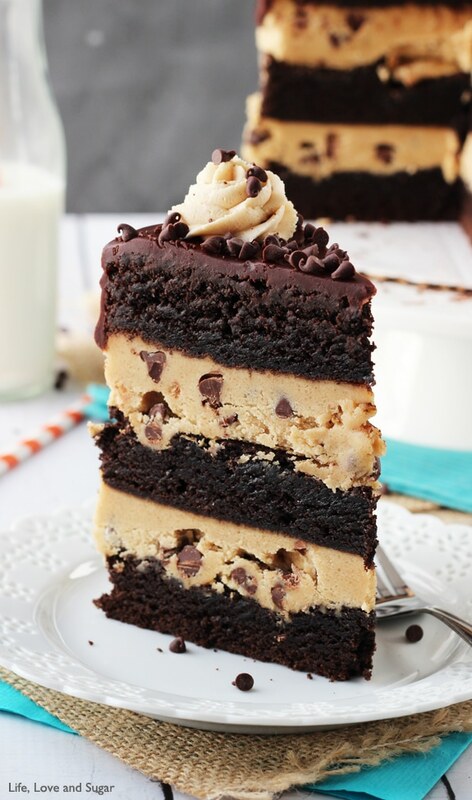 If you want to make a 9x 13 though, I’d splice the brownie layers into two, instead of 3 and have one layer of the cookie dough in the middle. Same amounts. Follow up- made this for my birthday! It was so easy and so scrumptiously delicious-but oh so rich. I made mine more rustic fashion (just plopped the layers together) and it was still gorgeous looking. Next time, I’ll make it in the 9×13 pan. But I’ll cut the cookie dough filling recipe in half (it’s really too rich) for just one layer. Everyone marveled at the cake and loved its taste! Thank you! I made this today for my nephew’s birthday and it was a huge hit! So decadent, no one could hardly finish a whole piece (but they tried!). My question is, how do you cut the cake, or what kind of knife do you use, to get such a perfect piece of cake for the photo? I have a very large knife that I use. It’s been a while since I took these photos, but I don’t remember doing anything special for the cake slice. I’m pretty sure the cake was nice and cold. Made this yesterday for my cousins birthday and it didn’t come out quite as pretty. The ganache didn’t drip down as pictured above so I just covered the entire thing with the ganache lol! It was a huge success though, received many compliments. This is a keeper in my books and I can’t wait to try your other recipes!!! Thx! Shoot too bad raw flour has a risk of E Coli. Made this for a co-workers Birthday, omg delicious. Everyone raved about it. Absolutely delicious, thank you for sharing the recipe! Taking it to a cookout tonight! Mine doesn’t like as pretty as yours but I’m sure it’ll be delicious! I’m sure it will be delicious! I hope everyone enjoys! This recipe was a huge success. I baked in a number shaped tin. I “vegan”ised the cake with chia seed “egg” substitution and non-dairy milk and margarine, and didn’t use peanut butter as I was afraid not everyone likes that flavour the cake. It was for a fifth anniversary party for my cinema group and it was a huge hit! It looked amazing and the cake itself was a huge success with everyone! Thank you.